Toronto Blue Jays closer Roberto Osuna was arrested and charged Tuesday morning with assault. The 23-year-old right-handed pitcher was released and is scheduled to appear in court on June 18. He has been placed on administrative leave by Major League Baseball. Toronto Blue Jays closer Roberto Osuna was arrested and charged Tuesday morning with assault, according to police. Police declined to say whether it was domestic assault. Const. Jenifferjit Sidhu said the charge is for one count of assault, and provided no further details. The 23-year-old right-handed pitcher was released and is scheduled to appear in court on June 18. 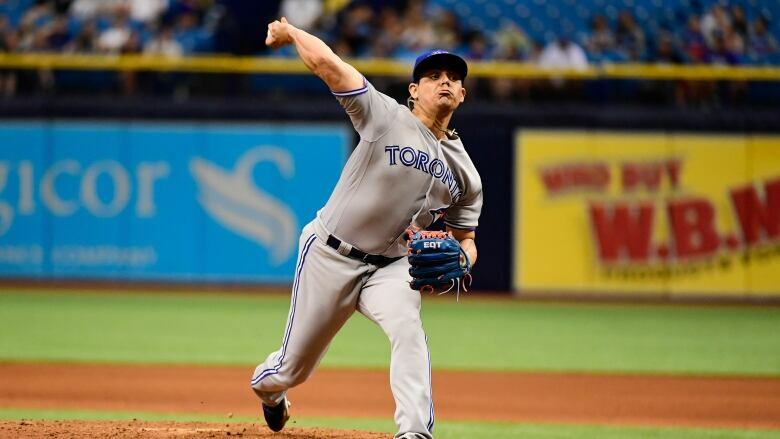 Osuna was placed on administrative leave by Major League Baseball. "We are aware of the incident involving Roberto and fully support the decision by the commissioner's office to place him on administrative leave," the Blue Jays said in a news release. "We are taking the matter extremely seriously, as the type of conduct associated with this incident is not reflective of our values as an organization. As this remains an ongoing investigation by Toronto police, the club will not comment further on the matter." "It depends on the investigation, it depends on the information that comes," Atkins told media before Tuesday's 5-0 loss to the the Seattle Mariners at Rogers Centre. "I think there are scenarios where this leave could be extended, it could be shortened, it could be seven days. The seven days is a default. ... [it depends] on the investigation whether that turns into more." Both Atkins and manager John Gibbons said they had spoken with Osuna at the ballpark earlier in the day, though neither would get into specifics about their conversations. Atkins said Osuna will not be around the team or at the stadium while he's on leave. "As it relates to the allegations, to say that we don't condone things of this nature is taking it very lightly," he said. "Specifically as to our emotions and to get that type of information as an organization, it's difficult to come up with words just to how seriously we are taking it." Osuna is in his fourth MLB season, all with the Blue Jays. The native of Juan Jose Rios, Mexico, has nine saves in 15 appearances this season with a 2.93 earned-run average and 13 strikeouts. "Hopefully there's nothing there," Blue Jays manager John Gibbons said Tuesday. "I love the kid, not because of what he's done for us on the field, but because of who he is and my relationship with him over the years. But really in society in general there's got to be zero tolerance." "You've got to protect the vulnerable and those who can't protect themselves a lot. Hopefully when it's all said and done he's back with us and it's all behind him and things turn out fine." Gibbons said it remains to be seen who will take over the closer role. The Blue Jays recalled right-hander Jake Petricka from triple-A Buffalo to take Osuna's spot on the roster. "We'll see how the games develop," he said. "We got a few guys who can do it. [Tyler] Clippard, [Ryan] Tepera can do it, [Seung Hwan] Oh can do it. Ax [John Axford] can even do it. Still feel pretty good about what's down there." The Blue Jays started a six-game home stand Tuesday night against Seattle. The team had planned a giveaway on Osuna T-Shirts to the first 15,000 fans attending Thursday's series finale against the Mariners. Instead, the promotion will feature Yangervis Solarte T-shirts. Under the joint policy agreed upon by Major League Baseball and the players' union in 2015 on domestic violence, sexual assault and child abuse, commissioner Rob Manfred has the power to suspend players even without criminal charges. "MLB takes all allegations of this nature very seriously," Major League Baseball said in a statement. "We are investigating the circumstances in accordance with the Joint MLB-MLBPA Domestic Violence Policy." Relief pitcher Aroldis Chapman was the first player to be disciplined under the terms of the policy when the league suspended him for the first 30 games of the 2016 season for an alleged incident on Dec. 7, 2015. Days later, Jose Reyes — a former Blue Jays shortstop — was suspended for the first 51 games of the 2016 season for an alleged incident while a member of the Colorado Rockies. New York Mets closer Jeurys Familia was suspended for the first 15 games of the 2017 season; charges against Familia and Reyes were dropped, while prosecutors did not file criminal charges against Chapman.